Join us this November 4th at the historic Greenhut Memorial Hall for an exciting evening of jazz featuring the talents of Mardra and Reggie Thomas from Saint Louis. This is sure to be an afternoon to remember. Tickets are $30 per person. Tables of 4, 6, 8, and 10 are available. Reservations can be made by calling 309.636.7022 or 843.371.0373. Please join us on Sunday, December 6th at 3:00 pm as Doug Day presents his fine reading of A Christmas Carol by Charles Dickens. This has become an annual tradition in the Historic GAR Hall along with a Christmas High Tea. Tickets are $10 at the door. Sunday, November 8 from 1–4:30 p.m.
Greenhut Memorial Hall, 416 Hamilton Blvd. Jazz on a Sunday Afternoon, Latin Style! Join us on Sunday, November 9th from 2 to 5 pm for an exciting, and we DO mean exciting, afternoon of jazz featuring The Brazilionaires. With a unique blend of sambas, Bossa Novas, and other tropical rhythms, the Brazilionaires perform original & traditional songs in English, Portuguese & Spanish. They’re also known for doing Latin versions of American & English rock/pop hits. Besides the catchy grooves, the band engages the audience for a truly entertaining experience. Featuring vocalist Dove Benoit, guitarist/vocalist Rico Wayne Johnson, Keyboardist Mike Nellas, Trumpeter Todd Kelly, Bassist Andy Crawford, Flautist Carlos Bopp and percussionists Tom Marko, Jason Brannon, & Nick Fairley. HOW MUCH? Only $25 per person. Reservations encouraged....the tables fill up fast! Tickets by reservation (call 309.636.7022) and at the door. We will look forward to seeing you there! Please join us for an exciting lunch program with Beth Akeson, Beth Jensen, Ryan Spain and Chuck Weaver for a discussion of the role of at-large members of the Peoria City Council. All speakers are at-large council members. The June Lunch Programs are free. You may bring your lunch. Drinks and dessert will be available. All programs are from 11:30 a.m. to 12:30 p.m. Doors open at 11:15. Lunch with Frank Macaman: "Everett Dirksen's role in the 1964 Civil Rights Bill"
Please join us for lunch with Frank Macaman as he discusses the role of Everett Dirksen in the 1964 Civil Rights Bill. Frank Mackaman is Executive Director of the Everett Dirksen Center in Pekin. Lunch with Randy Couri "Why Did the Lebanese Emigrate to Peoria?" Please join us for lunch with Randy Couri as he speaks in depth about the reasons that drove such a large group of Lebanese to make Peoria their new homes. Learn about the important Lebanese contributions to Peoria history and culture. OK Folks! They're BACK! Barry Cloyd and the Way Down Wanderers are performing at the Preservation Hall of the Grand Army of the Republic, the GAR Hall 416 Hamilton Blvd. Saturday June 7 starting at 730pm. This is going to be an exciting, DO NOT MISS event and we look forward to seeing you there! Ten bucks at the door for a priceless evening of uncommonly good entertainment. DO NOT MISS the 34th Annual Moss Avenue Sale! While you are there, be certain to stop by and visit the CILF booth. There are sure to be wonderful things to be seen and purchased, wonderful people to meet and a wonderful time to be had by all. We will see you there! On the anniversary of Lincoln's assassination hear stories and poetry about this vital moment in our nation's history including an eye witness account of that evening in Ford's Theater! Storyteller Brian "Fox" Ellis steps into Whitman's shoes to offer an intimate view of Lincoln, and the Civil War. This program is a fundraiser for the Central Illinois Landmarks Foundation. Join us for lunch on Thursday, March 27th, and learn common myths and misconceptions about historic preservation. Jim Bateman, Vice President of the Central Illinois Landmarks Foundation will be presenting the differences between the Historic Preservation Commission, Historical Society, and the National Register of Historic Places. This event is FREE to the public. Families, individuals, and industry professionals are welcome to attend. Bring your lunch and enjoy. *Drinks and snacks available for purchase. 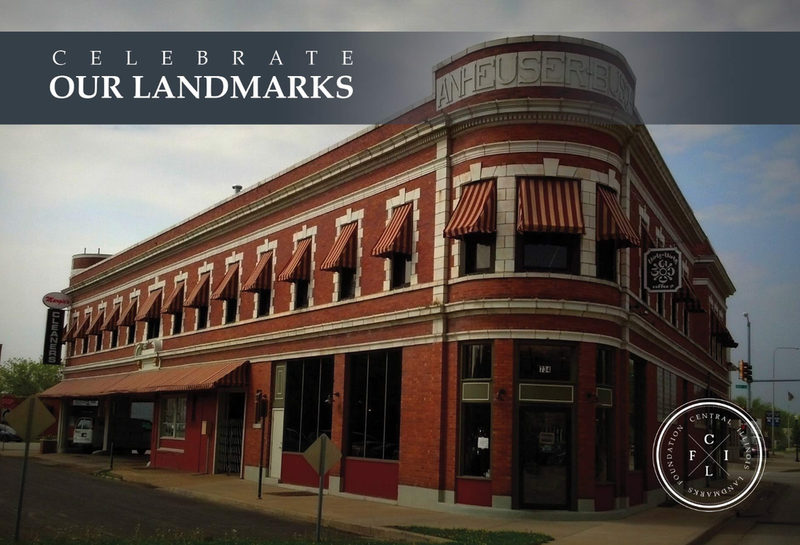 Join us Monday, March 10th as we celebrate the Kickapoo Building receiving historic landmark designation. Starting at 8:00a.m. enjoy a FREE cup of thirty-thirty coffee courtesy of the Central Illinois Landmarks Foundation. Limited amount!